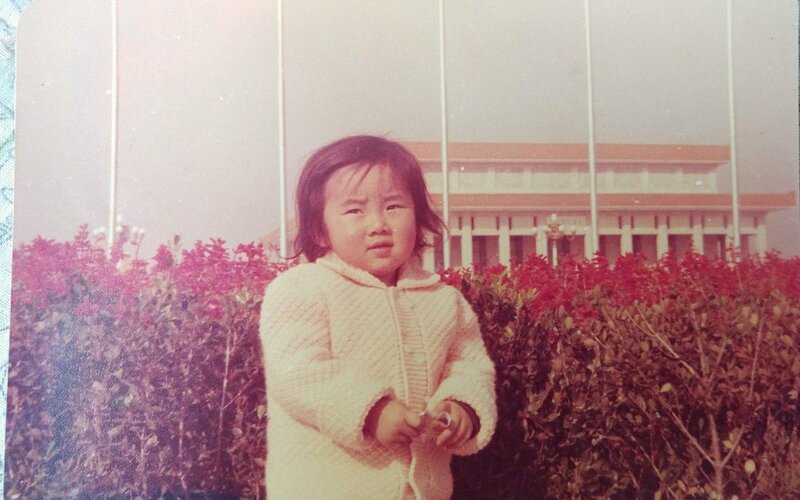 This photo was taken in May, 1969, at Tian’anmen Square in Beijing, when I was two years old. 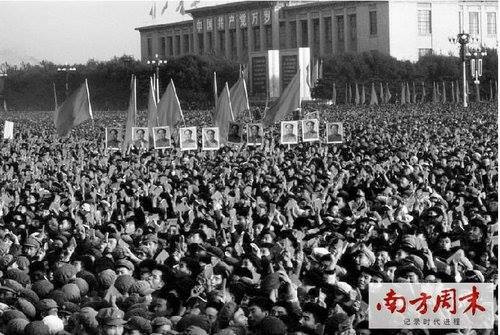 During the early years of the “Great Cultural Revolution”, millions of crazily enthusiastic “red guards” swarmed into Beijing from all over the country to “defend” “Great Leader Chairman Mao” with their lives. They could not only travel for free; but were also offered free food on the train. Although she was not a “Red Guard”, as she had already married and become a mother by then, my mother somehow also took advantage of the free travel and took me to Tangshan, a city near Beijing, to visit a relative. So this photo was taken at the famous Tiananmen Square when we stopped at Beijing on our way to Tangshan. Millions of “Red Guards” had just made pilgrimages there and seen their “Great Leader Chairman Mao” in person. Does every one notice the badges of “Chairman Mao” my mother and I were wearing? My mother also held a famous and “sacred” “little red book” of “Chairman Mao’s Words” in her hand. My mother told me that both the badges and the little red book were provided by the photographer who had a booth at the square and earned money by taking photos for people. We had to wear the badges and hold the red book if we wanted to take a photo. Did you see my angry expression in the photo? My mother said I was very unhappy that day, although herself managed to put on a smile on her face. And, not only that, when the photo was given to us, a pre-printed slogan saying ”Long Live Our Great and Esteemed Leader Chairman Mao” was already on it. There wasn’t any chance for anybody to say “no” to that slogan. I think perhaps the reason why I was angry on the day was that as a 2 year old innocent child, I knew Mao was a devil and didn’t want to wear his badge. However, I heard that there were hot-headed red guards pinning the Mao badges into their flesh to show their loyalty to Mao. Well, have we really learned the lessons? Probably not. Only today “Chairman Mao” is replaced with “the Rise of China”, “the Economic Development of China”, “Allowing Part of the Chinese People to Become Rich First”, “China’s Economic Power”, “We Must Love Our Motherland”, “Chinese People Are Doing Well”, "China Is Growing Faster than Most Other Countries", “China’s Prosperity and Stability”…, so on and so forth. And the list goes on and on. That’s why I feel compelled to write up such a long “caption” to this photo of my mother and me during the “Great Cultural Revolution”. Also, no matter how many times "Long Live Chairman Mao" was printed or shouted out loudly, Mao died in 1976. But his body is still inside the The Chairman Mao Memorial Hall at the Tiananmen Square for everybody to pay tribute and respect for until this day. Jennifer Zeng and her mother at Tiananmen Square in May, 1969.